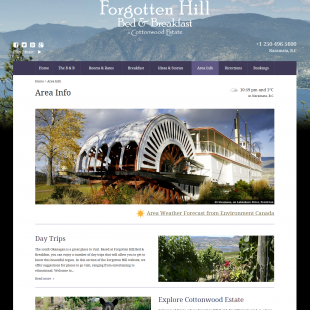 Sitting in relative isolation, the luxurious Forgotten Hill Bed & Breakfast offers fabulous views of Okanagan Lake, Penticton, and the orchards and vineyards of Naramata, B.C. We're proud to be associated with this new B&B, already known for its amazing customer service, extravagant and plush rooms, and a sparkling 5-star average rating on TripAdvisor. 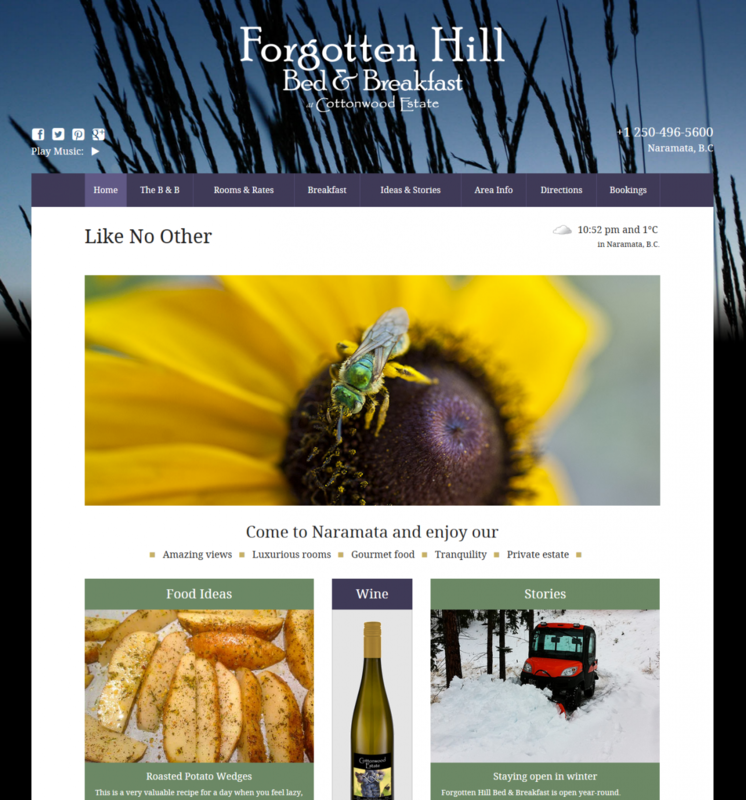 Cottonwood Estate, proprietors of Forgotten Hill B&B, engaged Taunt in the summer of 2013 to handle final updates, SEO, and web analytics setup for the web site they were about to launch. We also helped them get setup on various social media outlets such as Facebook and Pinterest, and provided training and guidance as to how to best utilize their social channels to promote their new business. 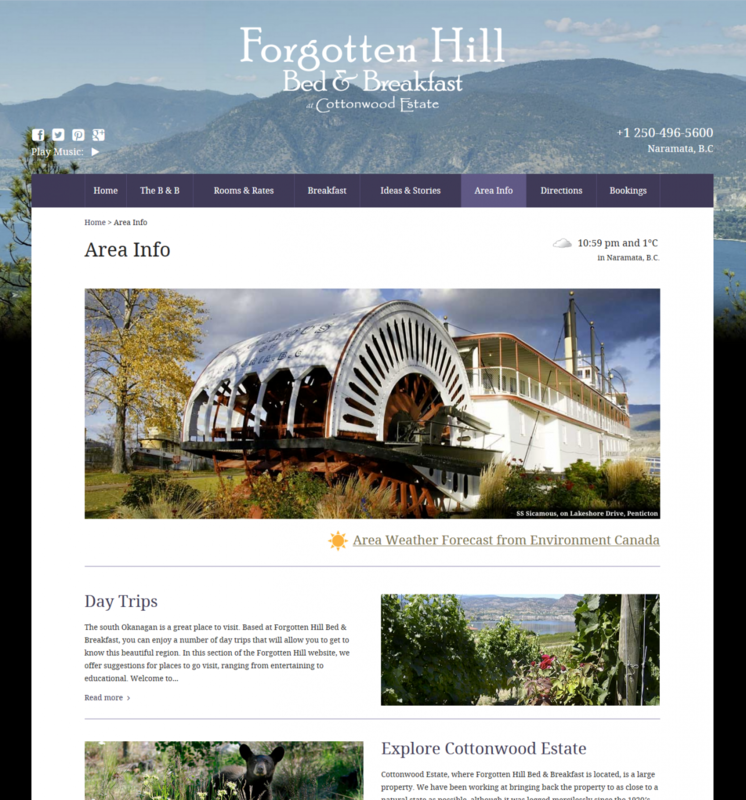 Based on our pre-existing relationship with the founders of Cottonwood Estate (we created an initial placeholder site for them earlier in the year), we took over deployment and ongoing maintenance once the core site was complete and near launch-ready. Since the site's launch, we've assisted with further WordPress customization, setup a staging environment for new content creation and feature testing, implemented security enhancements, handled troubleshooting and hosting-related issues, and trained staff in managing WordPress and related tools. 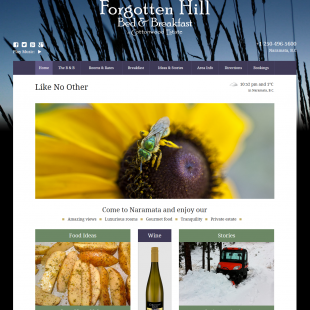 ForgottenHill.com is a mobile-first responsive site, based on a heavily modified version of the Bones WordPress theme. 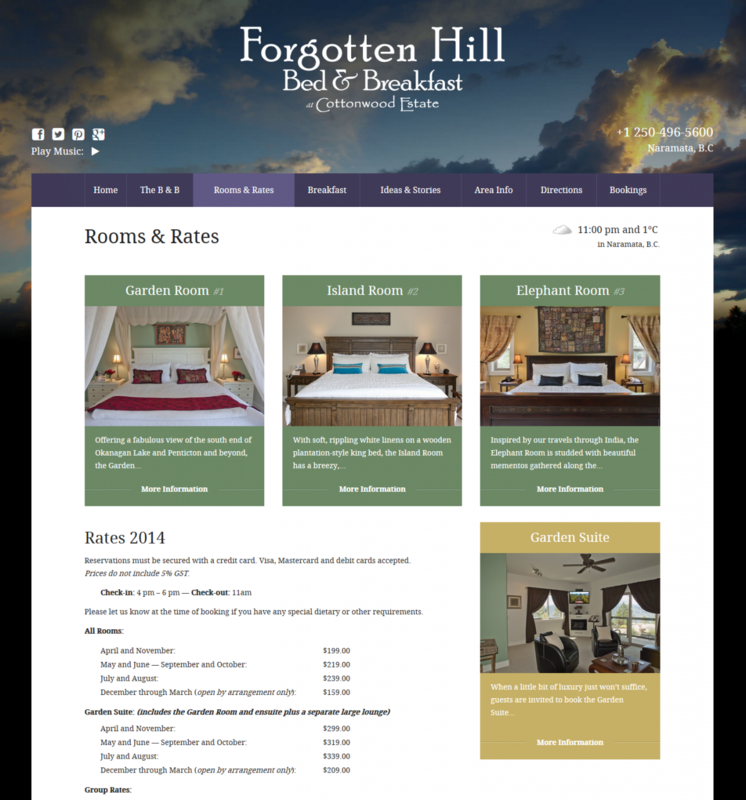 The theme was developed using the LESS CSS pre-processor to streamline stylesheet maintenance and improve extensibility. 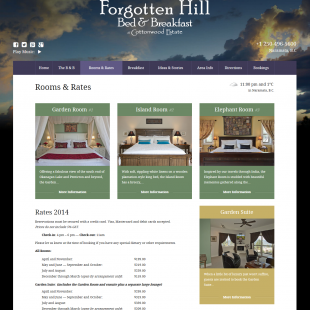 The custom WordPress install utilizes custom post types and taxonomies for room management and booking, along with custom user roles for site administration. We've also integrated Schema.org microdata to improve SEO and general findability, and implemented improved build processes to deploy the site to staging and production environments quickly and efficiently. 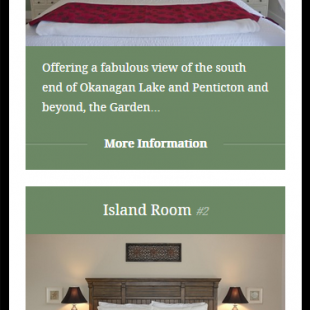 The visual design/UX and initial WordPress theme implementation were performed by our friends at Vancouver's DesignStamp Creative Group.